I adore this salad because it’s so delicious! It is also very tasty served warm or chilled. Using both potatoes and rutabagas in this potato salad delivers the classic potato salad taste, but in a healthier way by reducing carbohydrates and introducing a veggie. Yay veggies! Rutabagas are a bit potato-like and are often a bit sweet. They add a delightful orange color to the salad while the dill and celery add a nice touch of green. The eggs add a bit of protein and the celery and onion add a dash of crunch to the salad. Try my twist on the classic dish potato salad and add a healthy extra dose of veggies to your meal. You’ll love it! The 11 ingredients for this spicy mustard potato salad are easy to find ingredients (in the U.S.). I hope these ingredients are easy for you to find where you live so you can make this tasty salad for yourself and your family too. This side salad dish is easy to make. There is nothing complex about it; it’s very straightforward. Simple. Basically, peel and cook the potatoes and rutabagas, dice the other veggies, mix the dressing, stir. Dice the hard-boiled eggs and stir them in. Done:) Scroll down to easily print this recipe. I use a steamer basket insert for a pot to steam the potatoes and rutabagas, but they could also be boiled until soft as well. 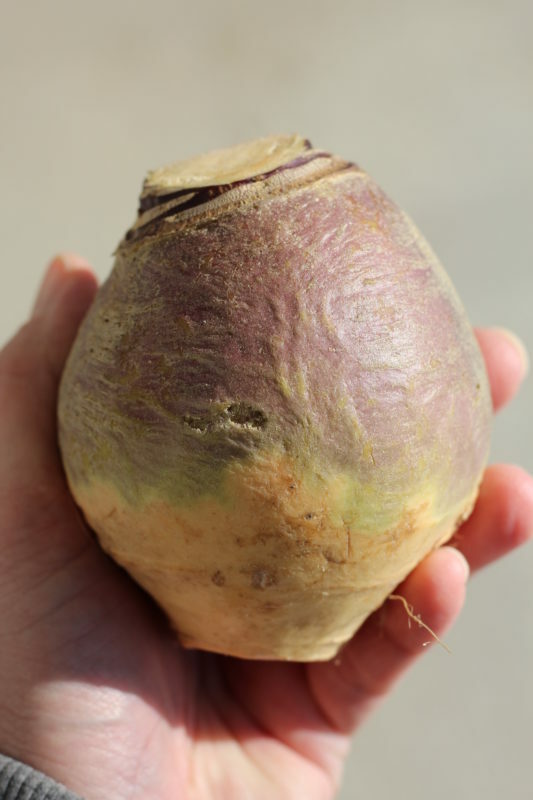 I always think of rutabagas as the under-used veggie, truthfully, it’s kind of ugly. But, inside is a gorgeous orange color. It isn’t seen in many restaurants where I live and it isn’t used in many recipes either. Yet, this vegetable is a healthy alternative to the largely loved potato. I love to glorify it and use this veggie; plus, it reminds me of a recipe my mom always used to make with rutabagas called a pasty. There is another recipe I created with the healthy veggie rutabaga, I call it the divine rutabaga lasagna rolls. It’s so delish and unique! I crave this dish and love its spectacular flavor! 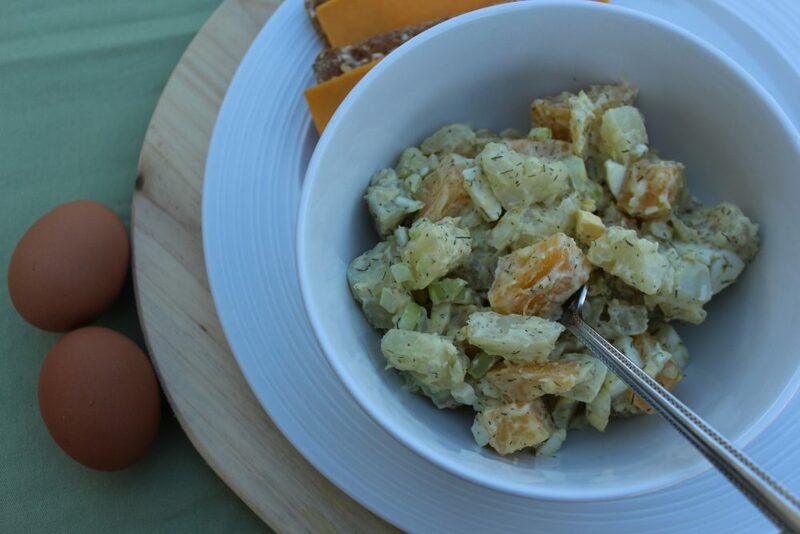 I have another version of this Rutabaga Potato Salad on my site, but I love this recipe even more, it’s my fave! My personal favorite it to eat it warm, but I also fully enjoy it chilled like traditional potato salad. Ugly, right?!?! But once you peel it, the inside looks much better and a gorgeous mellow orange color. This veggie side dish is perfect at picnics, BBQ’s, any lunch or dinner meal. I love to enjoy this dish alongside hard-boiled organic free range eggs with a side of cheese topped crispbreads. This side salad would be great at holidays as well. As I listed above, serve it warm or chilled. It will work well as a leftover too to add to a plate alongside a sandwich or other entree. As a vegetarian, I love this salad because of the extra added in protein with the addition of the hard-boiled eggs. We have a farm near us that sells organic free range eggs from a farm which is humane certified. I love that! I’m a total animal lover. The eggs are so delicious too! This recipe is from my cookbook that goes along with my blog. To check it out, click the image below. Potato salad is the ultimate summer side salad for parties, picnics, and BBQ's. This popular salad is a perfect side dish. 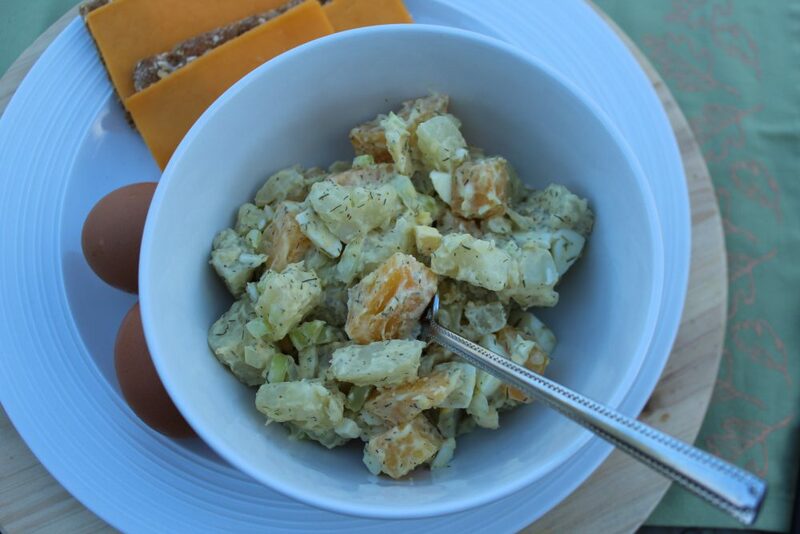 My twist on potato salad is to use rutabagas which serves to cut down on the amount of potatoes, and therefore carbohydrates, in the salad. 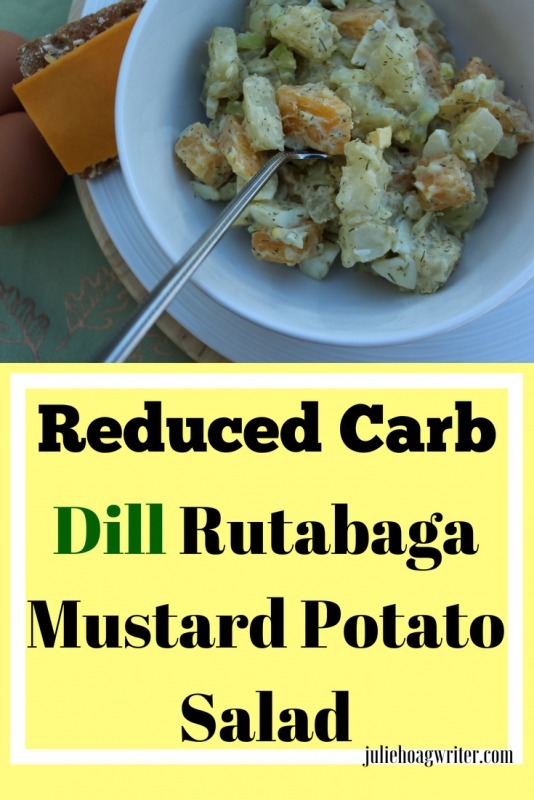 I love this Reduced Carb Dill Rutabaga Mustard Potato Salad it's super yummy! 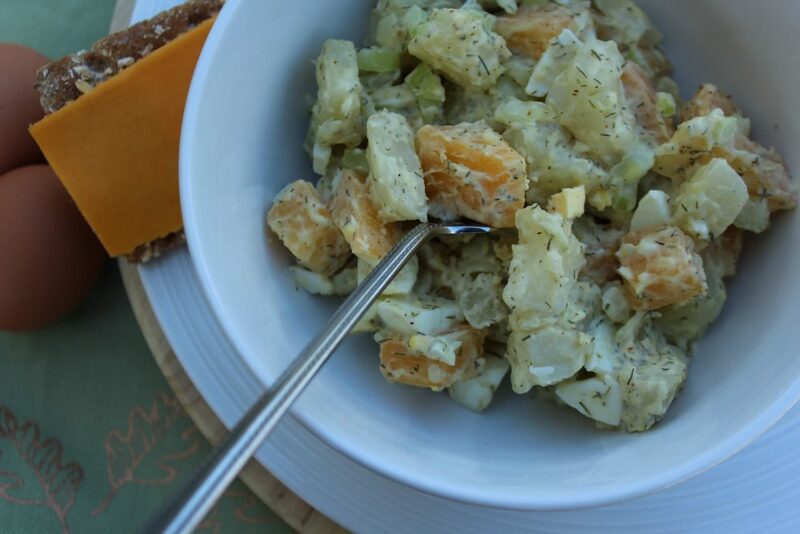 Enjoy this lower carb potato salad warm or chilled for a side dish at lunch or dinner. 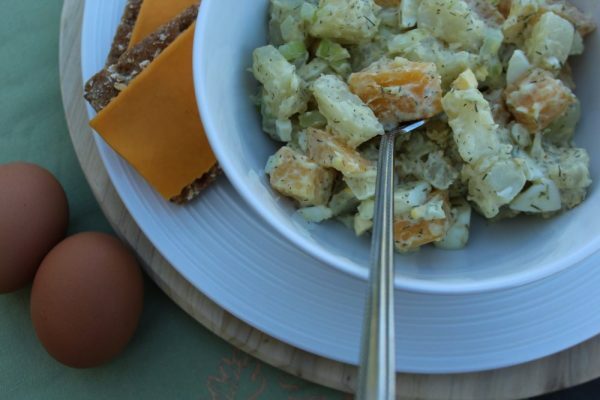 Enjoy potato salad in a low carb way with this salad recipe. Peel potatoes and cut into cubes for 4 c., peel rutabaga and cut into cubes for 2 c. then boil until soft. Add to a large bowl. Add 1/2 c. diced celery and 1/4 c. diced onion to potato rutabaga mixture and stir. Prepare dressing: 1/3 c. olive oil mayonnaise, 2 Tbsp. sour cream, 1 Tbsp. spicy brown mustard, 1/2 tsp. salt, 1 tsp. apple cider vinegar, and 1 tsp. dried dill weed. Stir dressing. Stir dressing into vegetables to coat. Dice 3 hard-boiled eggs and stir into the potato salad. Serve warm or chill to serve. This sounds absolutely awesome. I love dill in EVERYTHING! It’s yummy! I love dill too:) Thanks! Hope you enjoy!! This would be a nice switch to serve at grill outs over traditional potato salad. Yum! Yes, I completely agree! Adds in another healthy veggie and flavor to a traditional classic:) Thanks, hope you enjoy it! This looks like a great summer salad and my husband is cutting down on carbs so a great alternative! Thanks! You are welcome! It’s a great way to cut out some carbs but still get that delicious summer potato salad flavor. Hope you enjoy it! This sounds and looks so yummy! Love the orange color! Isn’t the mellow orange pretty? Love what this veggie adds to the appearance and healthiness of the salad. Thanks!